CNPS’s has native plants for sale every day, noon-6 p.m., at the Kneeland Glen Farm Stand. Photo: Carol Ralph. A selection of our chapter-grown native plants is available to buy every day, 12 noon-6 p.m., at the Kneeland Glen Farm Stand at Freshwater Farms Reserve, 5851 Myrtle Ave. (near Three Corners Market). If you don’t see what you want there, you can ask if we have it by contacting us at northcoastcnps@gmail.com. In late winter and very early spring, insect pollinators are scarce and wind is common. California hazelnut (Corylus cornuta), red alder (Alnus rubra), and coast silktassel (Garrya elliptica) are common species here that bloom very early, producing slender, dangling catkins of tiny, inconspicuous male flowers that produce clouds of pollen to be wafted around by the wind. Their female flowers become, respectively, the hazelnut, the alder cone, or the clusters of brittle-skinned berries of silk tassel. 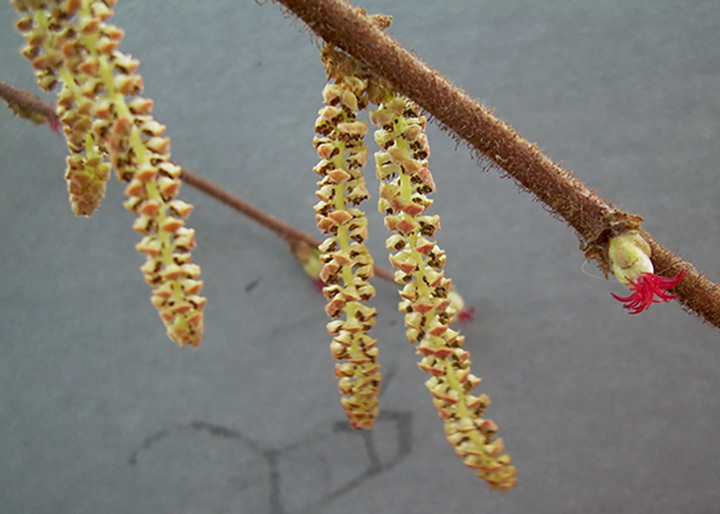 Dangling male catkins of California hazelnut, with one female flower. Photo: Donna Wildearth. Red Alder young female cones (ball-shaped) and male catkin (cylindrical). Photo: Donna Wildearth. Long, dangling, tinsel-like catkins make the male Coast Silk Tassel an attractive garden plant. Photo: Donna Wildearth. Berries develop in female catkins of Coast Silk Tassel. The stigmas, where the wind-blown pollen landed, are still attached to the tips of the fruits. Photo: Len Mazur. All levels of expertise are welcome on our trips. We all are or were beginners, and we all are ready to share. February 23, Saturday. Skunk Cabbage Trail Day Hike. Glowing, yellow lanterns of skunk cabbage, succulent mats of Pacific golden saxifrage, massive redwood, sitka spruce, and western hemlock, an ocean vista, wind-sheared coastal bluffs, ferny banks, mossy bigleaf maples, and sandy beach are along this section of the California Coastal Trail in Redwood National and State Parks. We will shuttle cars so we can walk one way the 5.6 miles from Skunk Cabbage Trail trailhead to Davison Rd. near the Gold Bluffs Beach entrance station. Dress for the weather in a shady forest and on an exposed beach. Bring lunch and water. Meet at 9 a.m. at Pacific Union School (3001 Janes Rd., Arcata). Tell Carol you are coming: 707-822-2015; theralphs@humboldt1.com. March 24, Sunday. Horse Linto Day Hike. Early spring brings fawn lilies, trilliums, and warriors to the oak woodlands and riparian forests of Horse Linto Campsite in Six Rivers National Forest and the road to it from Willow Creek. To see them we will walk a short, uneven trail and explore along the road. Dress for the weather; bring lunch and water. Meet at 9:00 a.m. at Pacific Union School (3001 Janes Rd., Arcata) to carpool. Return mid-afternoon. Please tell Carol you are coming: 707-822-2015, theralphs@humboldt1.com. Evening programs are free, public events at the Six Rivers Masonic Lodge, 251 Bayside Rd., near 7th and Union, Arcata. Refreshments at 7:00 p.m.; program at 7:30 p.m.
February 13, Wednesday. 7:30 p.m. “Rare and Endangered Conifers of the Klamath Mountains: Updates from the Field.” Educator, author, and ecologist Michael Kauffmann has been tracking the ecology and distribution of Klamath Mountain conifers for over 15 years, and his book, “Conifer Country,” is the definitive field guide to the region. Recently he has been working with the California Native Plant Society and the Klamath, Six Rivers, and Modoc National Forests to map and inventory the rare and threatened conifers of northern California from mountain summits to coastal river valleys. March 13, Wednesday. 7:30 p.m. “Ecology and Conservation of the California Pitcher Plant.” Daring to understand the ecology and distribution of the California pitcher plant (Darlingtonia californica), Jamieson Chilton, a student at Humboldt State University, will dive into the work he is doing on the ecology and future conservation of this unique species. This native, wetland plant inhabits poor, often serpentinous soils, and has resorted to carnivory to supplement nutrient deficiencies. It is not only unique to northern California and southwest Oregon, but it is also the logo for CNPS North Coast Chapter! March 23, Saturday, 9 a.m.-5 p.m. Sedge (Carex) Workshop. Sedge fan for 20 years, Gordon Leppig will lead an intense day of sedge identification and appreciation at Humboldt State University. Familiarity with keying plants in the Jepson Manual is required. This event has a fee: $120/$150 CNPS member/non-member. Register by March 1 at http://www.cnps.org/cnps/education/workshops.